Even Chamber of Commerce optimism met its match last Thursday, with a raging blizzard bringing 30 MPH winds, sub-zero wind chills, and buckets of snow. 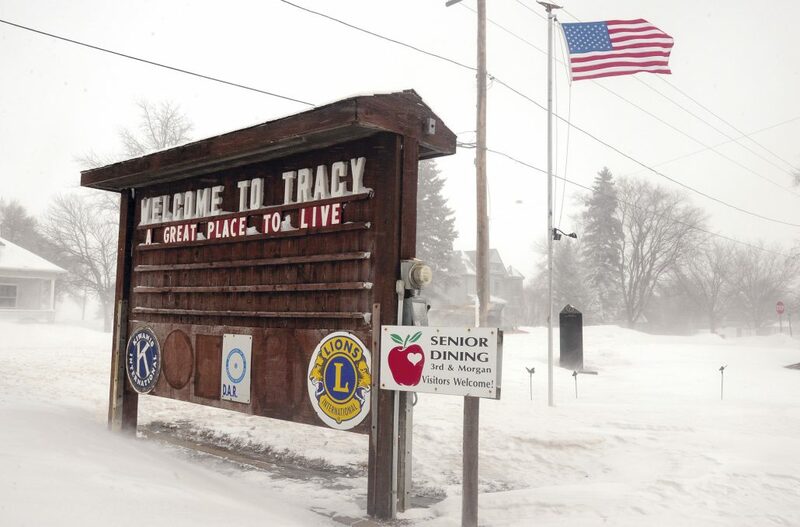 A snowplow had just passed the Tracy Chamber’s “Welcome to Tracy” sign along Hwy. 14, but had almost disappeared in the swirling snow. For polar bears and penguins, the weather has been absolutely sublime. But for just about everyone else, continued snow and cold has become a frosty test of forbearance. Fifteeen inches of snow fell in Tracy from Feb. 5 through Tuesday morning, adding to the already copious amounts of white stuff filling ditches and boulevards. Since Jan. 18, Tracy has been blanketed by 37 inches of snow. 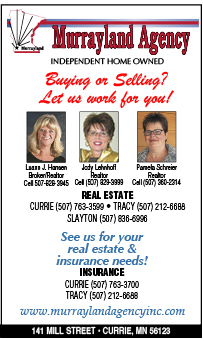 Snowfall this week bracketed a howling blizzard that brought northwesterly winds of over 30 MPH and shut down travel across the region Thursday. A National Weather Service blizzard warning was in effect from 9 a.m. to midnight Thursday, and forced local schools to cancel classes. Cement-like drifts in rural areas kept Tracy schools closed again on Friday. A new weather system with powdery snow and wind Monday afternoon and evening resulted in classes being called off again on Tuesday. Sub-zero temperatures chilled the area Thursday through Saturday, with the mercury reaching minus 14 overnight Friday. 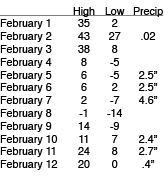 Since Jan. 19, Tracy has now experienced 15 days of sub-zero cold. But the latest icebox weather was still an improvement from the minus 28-degree reading recorded on Jan. 28. After a warm up Wednesday, sub-zero cold is forecast to return on Thursday and Friday of this week. Visibility was greatly reduced in Tracy Thursday afternoon, with “white out” conditions present in open rural areas.